Lately, my sessions have been filled with songs about apples, pumpkins, and all things fall…and I CAN’T GET ENOUGH! Can you feel the sweater weather, fluffy scarf, pumpkin spice love? Today, I’m sharing 3 resources that have been making their way into most of my early childhood and school based sessions. FALL SIGN LANGUAGE! I love this printable from Baby Sign Language, which includes pictures of signs that can easily be paired with your favorite fall songs. My other favorite signs to use during this time of year are leaf, tree, apple and corn. Pumpkin Counting Cards from The Kindergarten Connection. Laminate these babies, put them on a clip ring, and you’re ready to roll! Add clothespins for some extra fine motor fun. I like using these cards with improvised songs & familiar tunes like 5 Little Pumpkins. Bonus: the version below is great for counting AND emotion identification. If you’re in need of even more session planning ideas, don’t miss some of my favorite autumn activities, like this fall drum chant, a leaf movement experience and my 5 must-do pumpkin activities! My profound love of all things pumpkin doesn’t just stop at food. My sessions this month have been filled to the brim with all things autumn, harvest and…pumpkins! This week, I’m sharing 5 of my favorite pumpkin-themed activities that will have your kiddos jamming, moving, grooving in no time. 1. 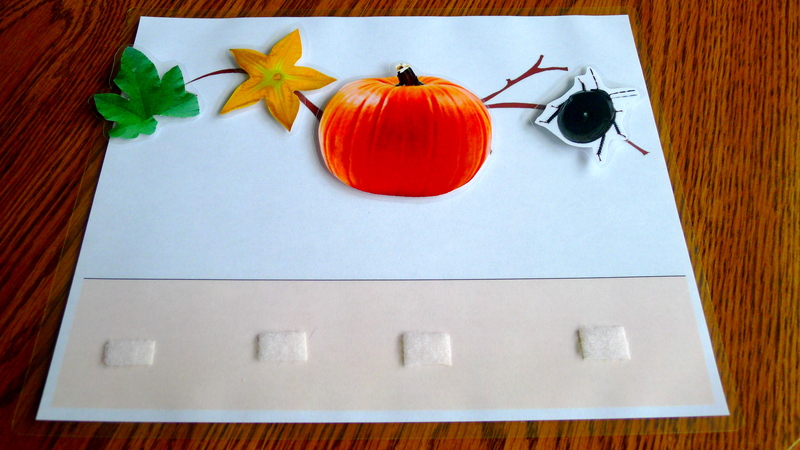 “Pumpkin Pie” Play Along (California Honeydrops): This is a great warm-up activity. Pass out shakers, guiros, sticks—anything that makes a nice scrapey sound. If you have a washboard, clients can take turns being a soloist (and if you don’t have a washboard, GET ONE!!!! It’s always a hit); otherwise, do some guitar strumming instead. 2. 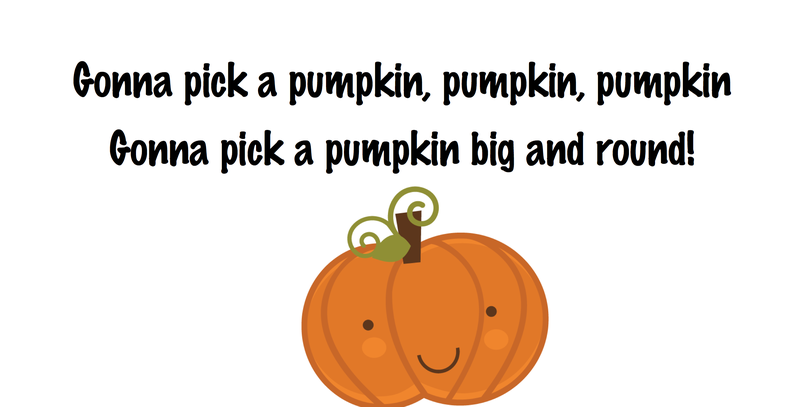 “Gonna Pick a Pumpkin” Chant: Okay…so I totally made this chant up in the moment while I was drumming with a kiddo. But it was really simple and fun, and was a great way to encourage my client to vocalize and work on playing a steady beat. If your clients are older, work together to come up with a fancy beat to play while you chant (or split into two groups and perform your beat for each other). You could even leave out the “big and round” part and have clients fill in the blank. 3. Pumpkin Vine: Click the link for a free download of the visual and to see how I use it! This little song is so catchy, and I guarantee you’ll be singing it all day. I love using this activity for fine motor skills, impulse control and decision making . 4. Pumpkin Bowling: If you really want to get the party started…do this one. Seriously! It takes all of 5 minutes to make and is fabulous for working on motor skills, turn taking and just overall group engagement. 5. 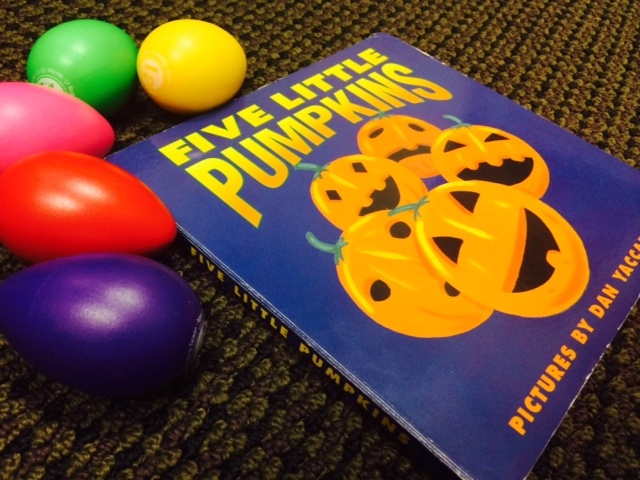 5 Little Pumpkins book: This is a classic song, but I am in love with having it in board book format. Singable books are a perfect cool down activity for little ones, and I like using this one for counting/basic math goals, visual attention and vocalizing (my favorite page has a big “OOOOOO!” that kids just eat up with a spoon). I also use shakers as pumpkins sometimes and take one away each time we turn the page. 6. BONUS IDEA! 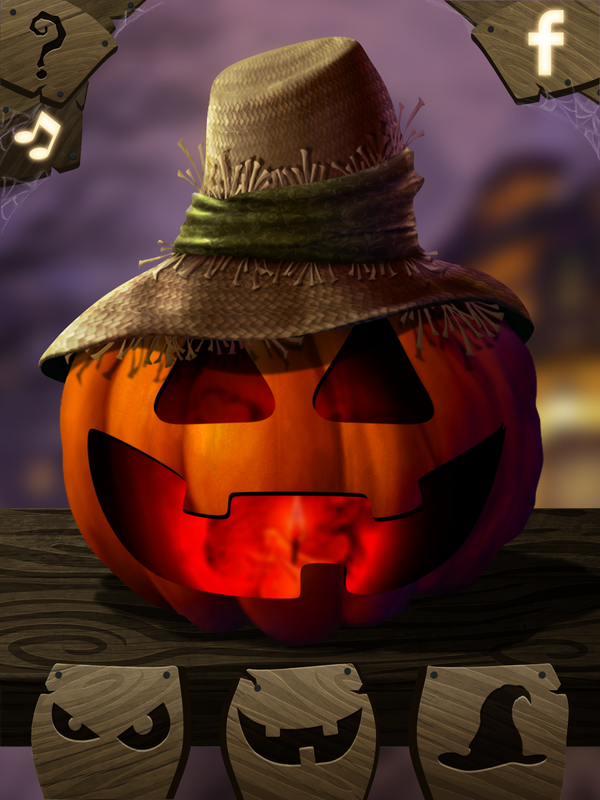 PumpkinFace HD App (free!) is easy to navigate and comes complete with spooky Halloween music. 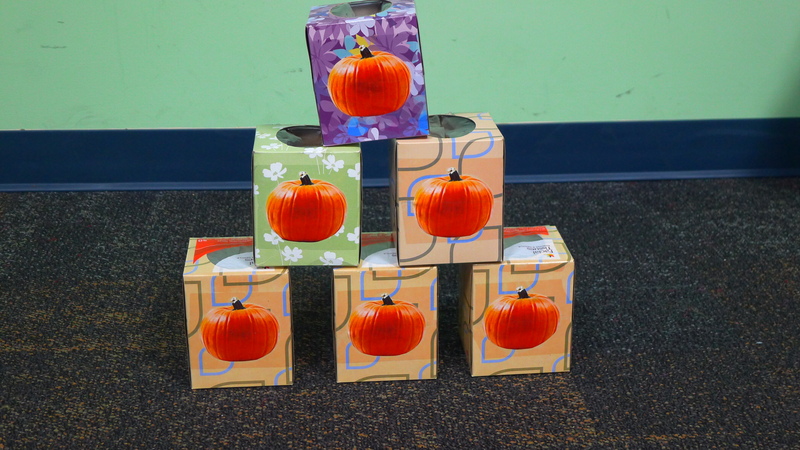 I use it to work on emotions, and have my kiddos select eyes, mouths and hats–then we sing and talk about how our pumpkin might be feeling. As the air (slowly…but surely!) gets colder here in Maryland and Halloween draws closer, I decided it was time to bring out some fun pumpkin activities for my sessions this week. One of my favorite pumpkins songs to use is a folk song called “My Pumpkin Vine” that I’ve adapted in a variety of ways for a range of populations. This week, I’m sharing the version that I created for children to focus on goals such as impulse control, decision-making, following directions and fine motor skills. 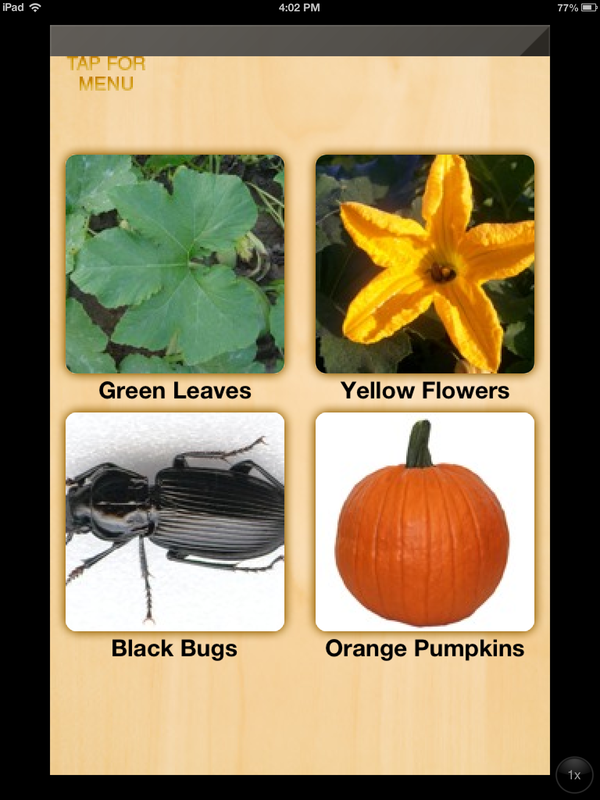 For this activity, I give each client one pumpkin vine containing a “picture bank” of images to add during the song. I display a choice board created for the song and ask for a volunteer to select an item to add to the vine by vocalizing or pointing to their desired choice. If you are an iPad user, I highly recommend a free app called Sounding Board, (https://itunes.apple.com/us/app/soundingboard/id390532167?mt=8). It provides simple choice board templates, which I find work great for my nonverbal clients. The app allows you to easily input photographs and record your voice, which provides great auditory reinforcement when these clients press their desired selection. Each time a choice is made, I will sing that verse of the song and encourage clients to move the targeted image from the “picture bank” to their pumpkin vine. I created my own chorus involving a 1-2-3 clapping pattern to increase engagement for clients who have finished placing their image on the vine. Some clients may need more direction and support than others during this activity, so each verse can be repeated as many times as needed. 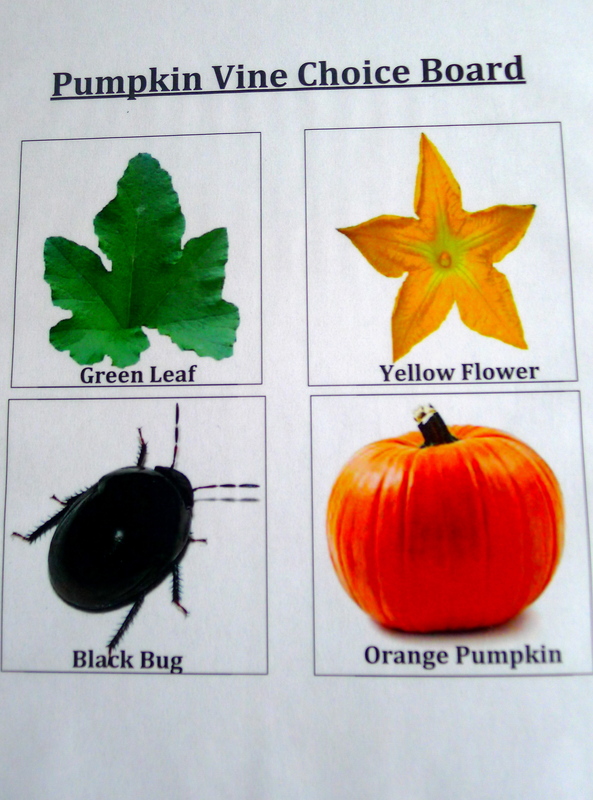 Expressive Language Skills: Have each client share an item that could be found on their pumpkin vine and add it into the song. Be warned: silliness may abound when you do this! I like to encourage creativity when I use this as a songwriting activity, and have heard suggestions ranging from squirrels and birds to Spiderman and video games! Art and Music: Have clients draw their own pumpkin vine. 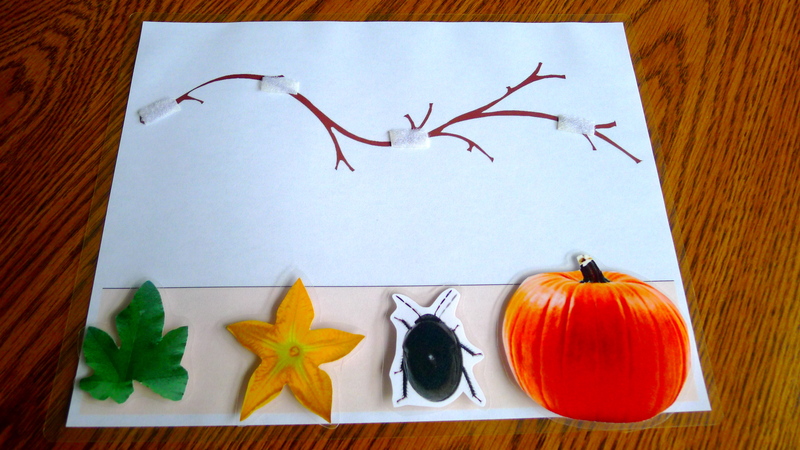 Instruct clients to listen to the song lyrics and draw only the items they hear on their pumpkin vine. Share pictures with the group after singing the song.